It's been one week since I have finished reading Les Miserables and, quite frankly, I'm still not quite sure what to say about it. I'm not even sure that this book is qualified for random reviews. 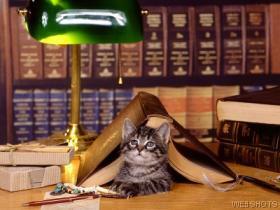 I'm sure you must be a scholar to address the various aspects and attributes that this book holds. I am very much UNqualified to give it anything more than five stars, two thumbs up, a round of applause, etc. etc. Perhaps some of you who chose to read it along with me will have something more valuable to say about it. I hereby confess to being wordless on the topic of this book. This was a book that my brother loved growing up. It looked rather daunting and I gotta say that sometimes (most times) I prefer quantity to quality reading. Grabbing hold of a 1,488 paged book isn't something that frequently falls on my "To Do" list. On this occasion, I am glad that I made the commitment to read it. My favorite character was, hands down, Monseignore Bienvenu, who I think we should all try to pattern our lives after. If there ever was a character worth admiring in the history of world literature, he would have to be the one. Kind, benevolent, caring, sacrificial. self-sacrificing, fun-loving, and devoted. My least favorite character was, also hands down, Cosette. I found her to be silly, stupid and selfish. I did not appreciate her attitude towards the man who raised her as her father. How quickly she forgot the sacrifice and care! That was something I very much did not admire. As for Jean Valjean -- I liked him. I found him to be the most exciting character in the story. Any part that contained him was sure to be entertaining and suspenseful. He is the reason that you read the book. However, Hugo did such an awesome job with each individual character's personal development and history that Jean Valjean should not be the sole reason that anyone would pick up Les Miserables. Jean Valjean is a pinpoint on a great, big beautiful map of a story! I really don't want to sit and talk about various aspects of the story in part (I have decided . . .) because with all the time and effort Hugo spent aquainting the reader with his characters, they become very close and personal, in a way. Hugo wasn't flippant and I feel like any review I would write of his story would be. I simply cannot get close enough. I just breathed his story and it will breathe out in various ways OTHER than a review this time. I set out to read the book in two weeks' time and managed to accomplish that. I think it's possible to read it in that time frame although if I had more than one kid and/or I worked outside the home, I probably wouldn't expect to finish it inside of a month! However long it would take a person, I would recommend that they take the time. That is not a nothing review at all, Carrie! I someday hope to return to Les Miserable and finally finish it. I should probably start all over again since it's been so many years. I feel like I know the story like the back of my hand however, being a huge fan of the musical and listening to that over and over again throughout the years. I enjoyed your review! Les Mis is one of my most favorite books, although it has been years since I last read it. Excellent in every way! It was daunting to me in the beginning, but my mom played Devil's advocate... She gushed and raved (which she never does) and then told me matter-of-factly that she thought it might be too much for me to tackle. :) Tackle it, I did, and never regretted it. Have you watched the Broadway musical? It is stunning. I have the soundtrack, and it never fails to stir me. Les Miserables is one of a small set of books I had to read for school that kept me up late at night because the book was so well written. I would love to go back and reread the book some day when I have the time. Your non-review is quite eloquent, in my opinion. And we both agree that the bishop is a model of what it means to be fully human. 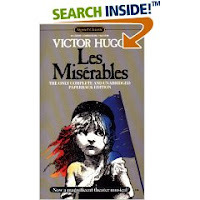 I invite you and your readers to visit my blog site, The Wisdom of Les Miserables: Lessons From the Heart of Jean Valjean, at http://algarrotto.edublogs.org. Here I come panting in to the finish line. But I have finished it, and it's truly marvelous. I really need to reread it at some point in French, because I felt like I was missing a great deal of Hugo's eloquence by getting a translation. But at least I can say I completed Les Mis. For the most part, I agree with what you have to say, Carrie, although I must respectfully disagree regarding Cosette. Yes, she seemed a little flighy at times, but I think she was absolutely essential to the story. Cosette symbolized light, in all of its fleeting qualities, and she offered the one small glimpse of hope for the future throughout the story. For all his important qualities, you had to know that Jean Valjean was not literally going to walk off into the sunset at the end. Cosette was always the future, and his end was necessary for her future to materialize in full. But I don't think that Cosette was ever meant to be a strongly developed or rounded character. Cosette was the light that kept Jean Valjean focused. You also have to remember that this is very much a book of its era. Even though it's French (and French lit, like Russian lit, tends to be a category all its own in terms of the values that are presented), it has that Victorian quality of polarized female characters. There is either Cosette, or there is La Thenardiess. And you know clearly who is the real heroine. In Les Mis, the anomaly was probably Eponine, who didn't fit into either category but proved herself to be a strangely likable character. Unfortunately, Eponine is the kind of female character that, even in contemporary literature, cannot really be the heroine. She's too harsh, and too unorthodox. But she certainly adds flavor to the story and one more name to the list of characters who fit into the title. Of course, I have no complaints about Jean Valjean. Truly a great hero, and I love that the reader got so close to him and yet never really got to understand him. He remains the man of mystery, the loner with a mission, the true Christian. A great character and an excellent example. So, here's my long-winded response. Thanks for the suggestion. I'm a little tired from taking it on, but I could never be sorry I read it. So, what's the challenge for December...? You know, I feel a little foolish admitting this, but I didn't really read Jean Valjean like a Christ-figure--although I can absolutely see the comparison in retrospect. I guess that because I saw him as more of a man who spent his life fighting his demons, then Cosette actually represented a kind of salvation for him. Not the kind that he earned at the end of the story, but the salvation of being someone for whom he could be selfless. No foolishness.I felt foolish for not seeing it right away either. Phhwwwt. I spent the reset of the book comparing him that way based on your earlier comment. Maybe we should BOTH read it again! You know, right after I posted that I remembered my previous comment--and then spent the rest of the evening trying to sort it out in my head. Here's what I've come up with (and it's a work in progress, as all literary analysis must be): throughout the novel, characters have moments that reflect Christ. Valjean in the garden is one, as is the moment when he lifts the cart off Fauchelevent (something like that? ), which could be compared to Christ carrying the cross. But he isn't the only character that has these moments. Fantine and Eponine quite literally sacrifice their bodies for others, Fantine for a daughter she doesn't really know and Eponine for a man who doesn't love her. There are other such moments that I can't think of right now. What I get from this is that the truly noble, truly Christian characters are those who reflect Christ at the most important moments in their lives. One of my reasons for this is that I think Les Mis is, at its root, a very Catholic novel. So, allusions such as those above will abound. And a works-based atonement is essential. For the same reason, I think Cosette is more likely to represent a Virgin-character, with her perfect purity and naivete. Yes, she's a little over-the-top in the perfection department, but that kind of character must exist in a novel like this. So, there's my new thesis. I might revise it in a day or so, but it works for me right now. Well, Carrie, I finally wrote MY review / thoughts today on LM and thus finally felt I could come visit you and see yours. I really agree with you about some of the depth, and Cosette was just a little bit vapid in the end. I enjoyed her simply because she gave the story some relief from some of the drag, but that was about my limit. Anyways, all in all, I'm SO glad I read it, would recommend it to anybody, and with some trepidation, might suggest that a reader with little interest should at least try an abridged version (a friend living in Turkmenistan only had access to one and said it was pretty decent and she enjoyed it where she would never had looked into the big version). I give it a 10 out of 10, though as a pensive book, not a bubble bath read! This is for calon lan. I found that throughout the novel much intention on Hugo's words to stress that Valjean is a christlike. I do not know if you all know this but Hugo has stated that Les Mis is a religious work and he had these intentions going into writing the book. From my interpertation i felt that the waterbucket scene was a very powerful one in which he looks very simular to Jesus Christ. Also at the very end of the book when Hugo states, "Behold the great martyr". Jesus Christ was said to be the great martyr which i found extremely interesting. Also Hugo comes out through Marius and states that Valjean is a saint and christ at various pionts in the novel. I would like to hear all of your coments and calon lan on valjean being christlike. Bullsfan - I read this book in Nov. 2007 and wrote the review up on 11/27/07. Your comment came in on 12/22/08 and I'm a bit more removed from the story. So I think I won't comment. I AM planning a reread of it though in February 2009 as 5 Minutes for Books (www.5minutesforbooks.com) is reading/discussing that as part of their Classic Bookclub in March. No doubt I will be better equipped to think through Valjean as a Christ figure and will have more to say then. Thanks for stopping by and leaving a comment and I hope you will join us at 5 Minutes for Books in March '09 for more thoughts and discussions! I am looking forward to reading this book again! I came back through the 5MFB discussion to see your review. I agree, there is just so much to the book, it is hard to say everything in one review. Reading through the comments, I don't think I thought of ValJean as a Christ figure. I can certainly see the parallels now, but I guess I was too conscious of him as a sinner (his initial hatred of Marius, his thought of actually letting the man accused in his place tale the fall, etc.) to think of him as a Christ figure. I saw him more as Christlike, as every believer should be -- struggling, sometime failing, but ever growing more like the Master.